This show has been on my list ever since it opened. Like I've said in previous blogs if it's a show I haven't seen I stay away from any reviews but the only thing I knew about this show was the change of music. After arriving at the theatre we were greeted by the lovely staff who told us our tickets had been upgraded and to head to the reception stand where they would be sorted out straight away. First thing that struck me was the lovely atmosphere in the foyer which is all Wonks themed from the merchandise stand to the sweet stands which all had Wonka Chocolate for sale. The theatre itself is stunning and has loads of space for waiting before and after the show. Lovely highlight was the outside balcony which was lovely to wait on in the sunshine whilst we waited to be allowed to our seats. The show itself is visually great to watch and stays close to the story in many ways. I won't include many spoilers for those who haven't seen it but the highlight of the show was the performance of Pure Imagination in act 2. I'd happily book again to see this show as the story was a firm favourite of mine growing up so if it's a group of adults going or if you are taking your children for the first time it's something you will both enjoy. I've wanted to see this show for a very long time and was excited when holly managed to get some tickets for 13th April for us both..Now the only film id seen was the Johnny depp version and I had big hopes for this show! The first thing that struck me when we got in to the theatre was the amazing merchandise that they had for sell its every child's dream to be surrounded by all things wonker..another thing was that the foyer had an amazing smell of chocolate I like what they did there.the theatre was amazing it was like some grand hotel and was very spacious so you didnt feel to cramped with everyone. We went to go to our seats and one of the FOH staff said we were having an upgrade as we were originally sat in the balcony but got given seats in the grand circle we were sat in Row H and seats 11 and 12 and I had the usual aisle seat and the view was amazing i could see every part of the stage the only downside was the seats were very uncomfortable and not enough leg room I found myself sat to the side with my legs hanging over the steps just to get comfortable but even that for 2hours 45 minutes I was still not comfy..so the show started and I couldn't get in to it from the get go and the first half really dragged for me and took a long time to get to the point of the show..the 2nd half was a bit better especially visually the set was amazing,but the one part that stood out was pure imagination that was truly something spectacular to see and I couldn't help but Hum along! 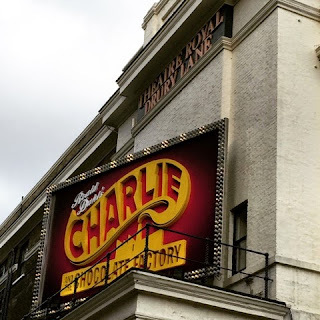 So all in all i really wasn't a fan of Charlie and the chocolate factory didn't make me want to go see it again and to be honest I was disappointed in the whole show! Just a warning there is some parts that use flashing lights and i did not see any notices mentioning that so just a heads up on that!